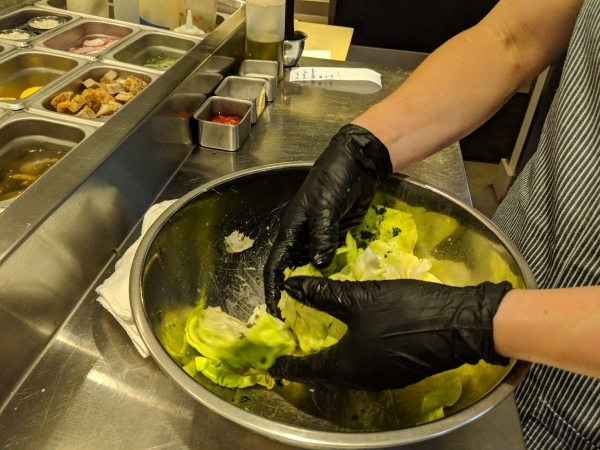 “How Chefs Roll” takes you inside the kitchens of local chefs to learn more about the chefs, their culinary approach and how they prepare food for their restaurants. CINCINNATI -- A 17-year-old high school girl walks into a five-Mobil-starred restaurant kitchen which was pumping with the adrenaline of full grown men with bandanas. How do you think this story goes? While this may sound like the prelude to a punchline or a tale about to go horribly wrong, it’s in fact, the opening chapter of Bridget Lieb’s culinary career. Fast forward to present day, Lieb and her husband, Jeremy — both trained chefs — own and operate the Sacred Beast in Over-the-Rhine. Depending on the day, you might find her on the cooking line, managing the front-of-the-house, crunching payroll or even pulling out the toolbox to fix the kitchen equipment. A Cincinnati native and Seton High School graduate, Lieb joined Chef Jean-Robert de Cavel’s brigade at the Maisonette in 1994 when she was still finishing high school. “The minute I walked into the kitchen … I knew that was what I wanted to do with my life,” she said. Lieb went on to culinary school at the Culinary Institute of America (CIA) and after graduation in 1996, landed in the high-end French restaurant, Le Cirque, in New York. The standards were exacting and the competition among the cooks was fierce. The restaurant industry, particularly the back-of-the-house, is historically male-dominated. Lieb described the work environment as “tough” but she turned it into a challenge. Armed with the attitude of “let’s make it happen,” Lieb became the first woman to work the hot (cooking) line at Le Cirque. She was clear-eyed about how she interacted with her colleagues and defined what was acceptable. The high-intensity environment also taught her something else. “I learned how to be strong and not mean,” Lieb said, a skill she largely attributes to the ability to understand people as individuals first and foremost. Lieb went on to work at other high-profile restaurants including Cello in New York, and later, at Aureole, Alize and The London Club in Las Vegas. She and Jeremy made sacrifices so she could be a stay-at-home mom. She stepped back from her frenetic restaurant career, and Jeremy became the sole breadwinner. “I made sacrifices and so did Jeremy,” she said, adding he was constantly working and missed many “firsts,” such as the kids’ first words and steps. Twelve years and two kids later, Lieb is back. Remember that 17-year-old girl? She’s not only at the top of her game, she now has a few more “recruits” on her team: her husband and two kids. “Now, we’re creating our own story,” she said. 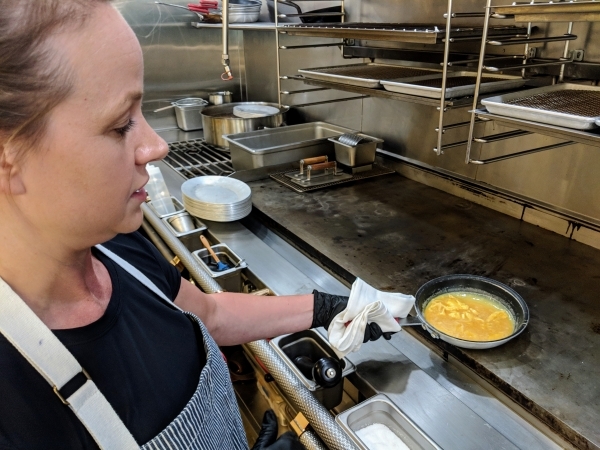 “An omelet is so simple but so difficult,” Bridget Lieb said as she drizzled beurre monté into a pan. Beurre monté is emulsified melted butter, and in Lieb’s case, made with a spot of cream. 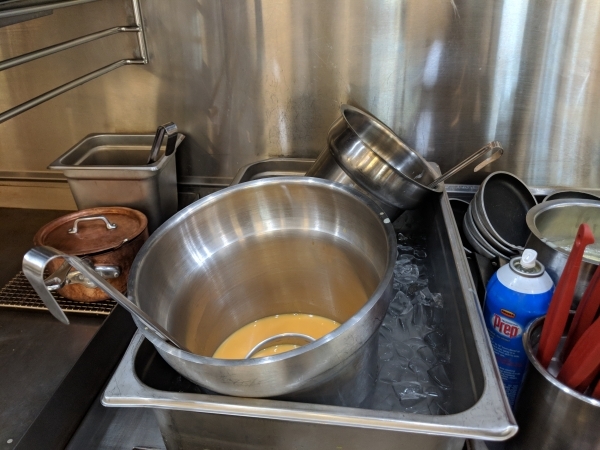 “(The cream) helps to keep the butter emulsified,” she said. Lieb then ladled eggs into the pan and placed it at the rear of the griddle. The rear was hotter which got the eggs cooking. Lieb watched it closely, looking for the sides of the eggs to start pulling. Patiently, Lieb continued to do this until the eggs started to form “ribbons” in the pan. Then she added goat cheese crumbles and piquillo peppers—sweet chili peppers with no heat--that had been roasted, peeled and diced. Lieb finished the omelette in the salamander to avoid any browning at the bottom of the pan. It was just a matter of seconds when she pulled the pan out and announced it was ready. She dipped her spatula into the beurre monté and proceeded to loosen the omelette from the pan. The beurre monté not only helped to free the omelette, it also gave the finished product a beautiful sheen. 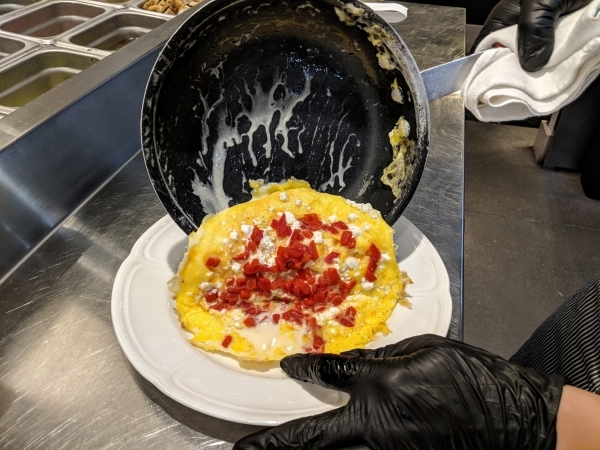 As the omelette slid out, she folded it in half and finished off with a garnish of chopped chives and a light sprinkle of coarse salt. Next, a salad of Bibb lettuce dressed with sherry vinaigrette went on the plate. The salad gave the dish color and freshness, with just enough tang to balance the luxurious omelet. 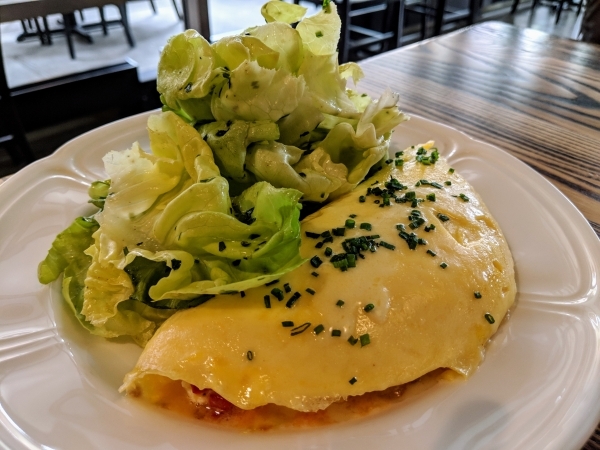 The silky-soft omelette was studded with flavor: briny goat cheese interweaved with piquant piquillo peppers. The dish clearly illustrated Lieb’s culinary philosophy: simple food that’s done right. Grace Yek writes about food for WCPO Digital. She is a certified chef-de-cuisine with the American Culinary Federation, and a former chemical engineer. Questions or comments? Connect with her on Twitter .